This is so disturbingly hilarious! What did he think that no one will report him to the police? 38-year-old Jonathan Giraldo has been arrested after looking for work as a 'hitman" on Facebook.The native of Peru, allegedly set up a Facebook page, where he advertised his “services” as a contract killer and used the alias "Tony Garcia" with nickname "Anthrax". 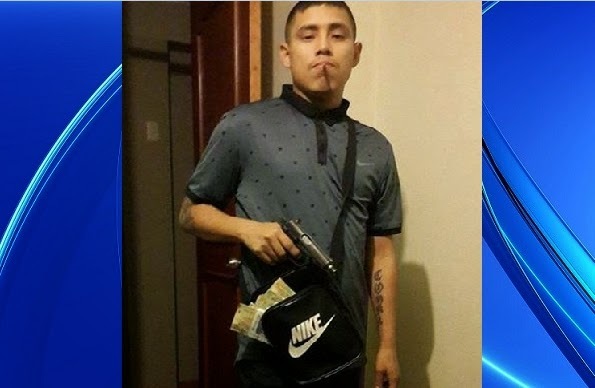 After receiving distress calls about this usual post, the Police tracked him down after he used real videos and photos of himself posing with weapons, including a pistol with a silencer attachment and bundles of cash. A Police spokesperson said Giraldo is being held on charges of possession of firearms. “The truth is that at the moment, we don’t know if the suspect really is a hitman or if he is just a fool with making up a fantasy life in his bedroom", he added.